Ad from December 1916 issue of Everybody's Magazine featured Joan of Arc, a character from one of Mark Twain's lesser known works. If the customer agreed to keep the set, they would remit $1 within five days and pay $2 a month for twelve months. 1916 green cloth binding for the Author's National Edition. Christian Science was Volume 25, the last title in the set. The 1916 green cloth binding featured five panes of gilt stamping on the spine along with the words MARK TWAIN, the volume's title and HARPER'S at the bottom. The top edges were gilt and the sides and bottom were deckled or ragged. The 1916 Author's National Edition volumes contains the same features as the red cloth Author's National Edition as regards physical dimensions and number of illustrations. A May 1917 ad from St. Nicholas magazine featuring the words "humanity" and "spirituality" aimed at World War I consumers. Advertisement in Outing Magazine for October 1917 indicates Harper had instituted a price increase of $1 on the set for a total of $26. Customers were required to send in $2 within five days and pay $2 a month for 12 months. United States troops had arrived in France earlier that summer and this ad featured Joan of Arc leading a group of World War I soldiers. An added option in the advertising featured sets in red half leather bindings that could also be purchased on the installment plan for $2.50 on delivery and $3 for twenty months for a total of $62.50. In the midst of World War I, Harper and Brothers featured advertising with a patriotic theme in their Mark Twain ads. Prices for the green cloth Author's National edition continued to rise. In the fall of 1917 Harper begin to make subtle changes to the set including rearranging the stories which appeared in Volumes 21, 22, 23 and 24. Ads mentioned that sets were being printed on trimmed pages rather than untrimmed or deckled. Volume numbers were being added to the spines. The word "all" was eliminated from the authorized uniform edition statement. New printing plates were being used and the list of illustrations pages were dropped from the volumes. This statement appears on the back of the flyleaf in all volumes of the Harper's Author's National Editions from 1910 - 1916. 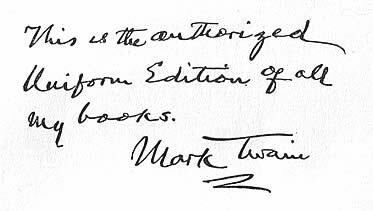 In 1917 Harper removed the word "all" from the statement -- an acknowledgment that the sets did not contain all of Mark Twain's books. Beginning in 1917 volume numbers were stamped on the spine of the green cloth Author's National Edition. Ad from The Outlook, November 28, 1917 selling comfort to a tired world through Mark Twain's works. The ad indicates Harper would soon be instituting another price increase in the set. Over the next two years advertising reveals that Harper and Brothers instituted several price increases in the green cloth Author's National Edition. Ads running in June 1918 priced the set at a total of $29. By May 1919, the price has risen to $32, payable in fifteen monthly installments. The price had increased, but the company was allowing customers a longer time to complete the payments. 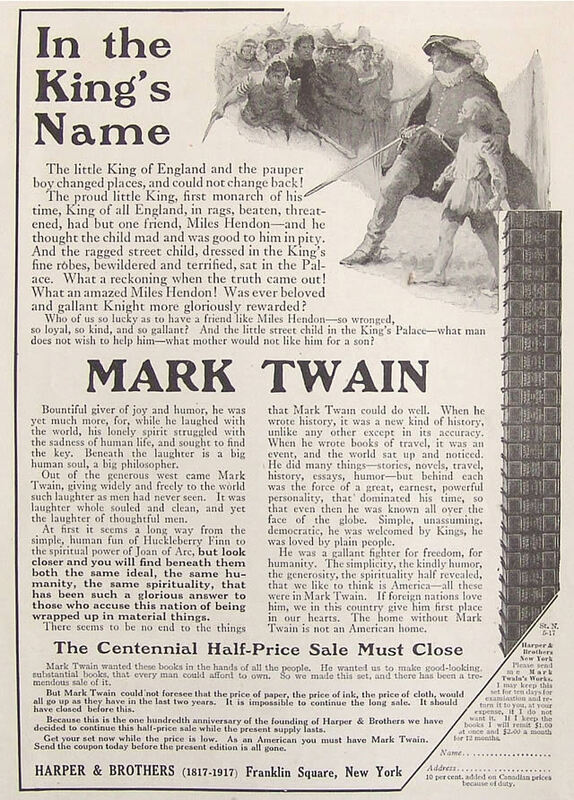 Advertisement from Green Book, May 1919 features a patriotic ad copy stating Mark Twain was a favorite among America's soldiers and sailors who employed the spirit of real Americanism. The price of the green cloth set had risen to $32, payable over fifteen months. By the Fall of 1919 Harper and Brothers had decided to issue the Author's National Edition with four additional volumes -- a four-volume set of Albert Bigelow Paine's Mark Twain: A Biography which had been published in 1912. Paine's biography was bound in the same green cloth to match and featured volume numbers 1 through 4 stamped on the spines -- numbered separately from the other volumes. The New York Times announced the sale on November 23, 1919. Even though Paine's four volumes were advertised as "free," the cost of the set had now risen to $37.50, payable in installments over an eighteen months period. Ad from Atlantic Monthly for December 1919 featuring a "free" four-volume set of Albert Bigelow Paine's Mark Twain: A Biography bound to match the green cloth Author's National Edition. The cost of the set of 29 books was $37.50 payable over eighteen months or an 8% discount with total payment. By January 1920 Harper had again increased the price of the Author's National Edition to $44.50. 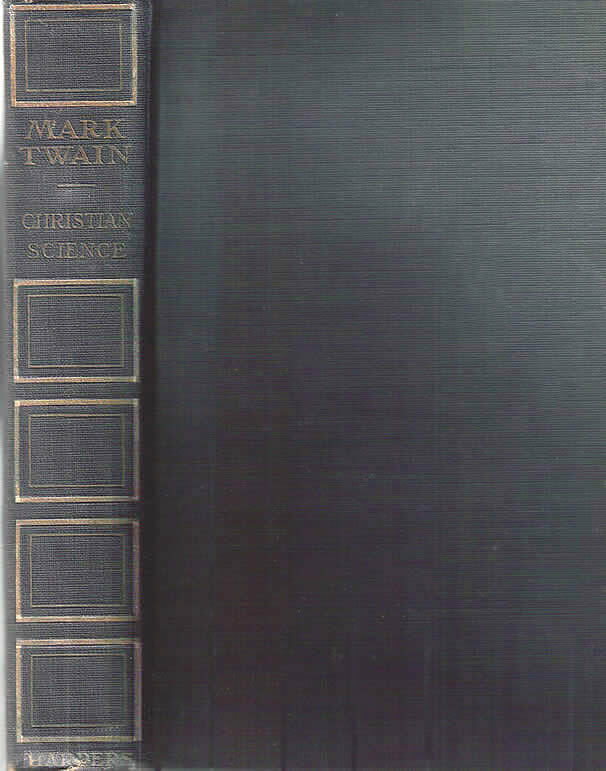 Paine's four-volume set Mark Twain: A Biography was advertised as available in matching bindings through May 1920. The Author's National Edition in red half leather binding was no longer being advertised. In its place were ads for a black half leather library edition with silk finished cloth sides, and gilt tops. By the fall of 1920 Harper had suspended advertising the 25-volume Author's National Edition. Instead, Harper's advertising campaign was for twelve volumes of Mark Twain's works paired with five volumes of Rex Beach's works. This ad from Harper's Magazine for November 1920 sells the first twelve volumes of the Author's National Edition in green cloth bindings combined with five volumes from author Rex Beach. Although the ad graphic features a quote from Huckleberry Finn, that book would have been Volume 13 of the Author's National Edition and not included in the offer. The sales campaign to sell twelve volumes of Mark Twain's works in conjunction with Rex Beach's works continued into the spring of 1921. Prior to 1917 each volume included statement, "This is the authorized Uniform Edition of all my books. 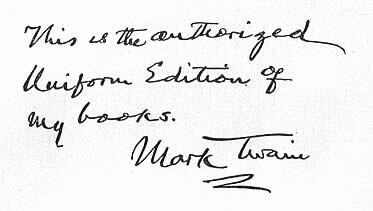 Mark Twain." Archives of Harper and Brothers, 1817-1914 [58 microfilm reels]. (Cambridge, England: Chadwyck-Healey; Teaneck, NJ: Somerset House, 1980). "Books of the Month," National Magazine, January 1915, pp. 724-25 (online via google books).